Main Attraction of the Fort : Sonwa Mandap, SunDial. Nearby Attraction : Asokan Pillar. Chunar's claim to fame is that all the Ashoka's inscriptions and pillars scattered throughout India were made of sandstone quarried from this place. These inscriptions are the most important written documents that inform us about the politico-social conditions of the 3rd century b.c., in India. The area is rich in sand stone and for centuries Chunar sand stone has been used. The highly polished Ashokan pillar was built from the sand stone from Chunar. History says that the place was existing in days of Vikamaditya, who had occupied the place way back in 56 BC. 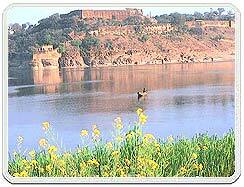 There is also a well-known fort at Chunar that every ruler coveted. One of the mightiest fortresses of medieval India, it caught the concentration of Humayun, the Mughal Emperor, and Sher Shah, the Afghan ruler, drawing both to the battlefield with a common purpose -the fort had to be captured. The fort is attributed to the legendary Sher Shah Suri. The fort has also seen the live samadhi being taken by Bhartrihari within its premises. The Chunar Fort is secluded by massive rampats which look down the flowing river and often when the river leaves the shore, the citadel overlooks a beautiful beach. From the rampets the sunset is very gorgeous to watch. Akbar once captured this fort but till the Britishers came in 1764 this fort was under the Nawabs of Awadh. The main attraction inside the fort is the Sonwa Mandap, the Sun Dial and the Huge Well.